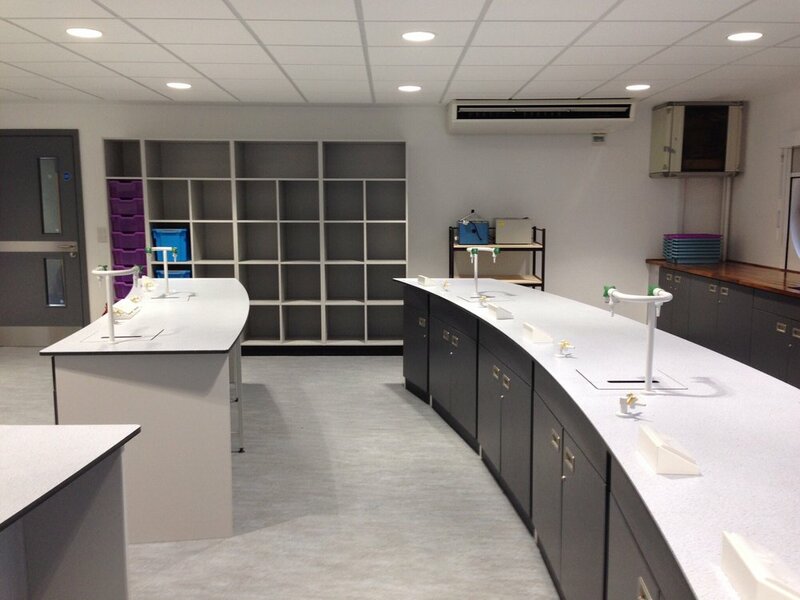 AJT IS INVOLVED WITH ALL ASPECTS OF AN EDUCATIONAL LABORATORY INSTALLATION INCLUDING THE SUPPLY & FIXING OF FURNITURE, FUME CUPBOARDS, SPECIALISED SERVICES, FUME EXTRACTION, CHEMICAL WASTE DISPOSAL & FLOORING SYSTEMS. Carrying over 50yrs experience, at AJT we pride ourselves in being the experts in Educational installations. A unique, captivating and functional environment can make all the difference to a learning/work environment. GIVE YOUR STUDENTS A HEAD START AND PROVIDE A LEARNING ENVIRONMENT FIT FOR ALL NEEDS. WE OFFER A COMPREHENSIVE RANGE OF DURABLE & ROBUST FURNITURE THAT COMPLY WITH ALL THE LATEST HEALTH & SAFETY REGULATIONS & HAVE A NUMBER OF MULTIPURPOSE STORAGE OPTIONS. We understand the unique complications and requirements involved in the logistical management of an educational installation and we go the extra mile to ensure all works are to the highest of standards, and comply with all relevant regulations. With your personally assigned project manager you can rest assured that your project will be a smooth and stress free experience with a fast turn around and minimal disruption. WELL DESIGNED, CLUTTER FREE ENVIRONMENTS ENABLE THE FREE FLOW OF THINKING AND MOST IMPORTANTLY ENSURE A SAFE LEARNING ENVIRONMENT. ALL OF AJT'S EDUCATIONAL SOLUTIONS ARE TAILORED TO EXACT REQUIREMENTS AND DESIGNED WITH DURABILITY & FLEXIBILITY IN MIND. RECONFIGURABLE LAYOUTS DESIGNED TO ACCOMMODATE MANY DIFFERENT TEACHING & LEARNING STYLES. At AJT We understand that one size does not always fit all. We are known for our unique, flexible and multi-functional classroom layouts.